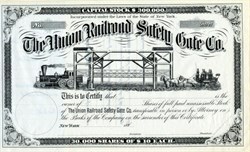 Beautifully engraved unissued certificate from the Union Railroad Safety Gate Company printed in the 1880's. This historic document was printed by the Jones and Williams Company, N.Y. and has an ornate border around it with an elaborate vignette of an early Safety Gate Railroad Crossing with a train, crossing guard and state coach with the name Tally Ho on the side. This item is over 117 years old.